FACT CHECK: Do Recent Wildfires Match Up “Exactly” with California’s Proposed High Speed Railway? Do Recent Wildfires Match Up “Exactly” with California’s Proposed High Speed Railway? A conspiracy theory suggests the deliberate burning of populated areas to make way for a high-speed rail system. The November 2018 California wildfires matched up “exactly” with the route of California’s proposed high speed railway. 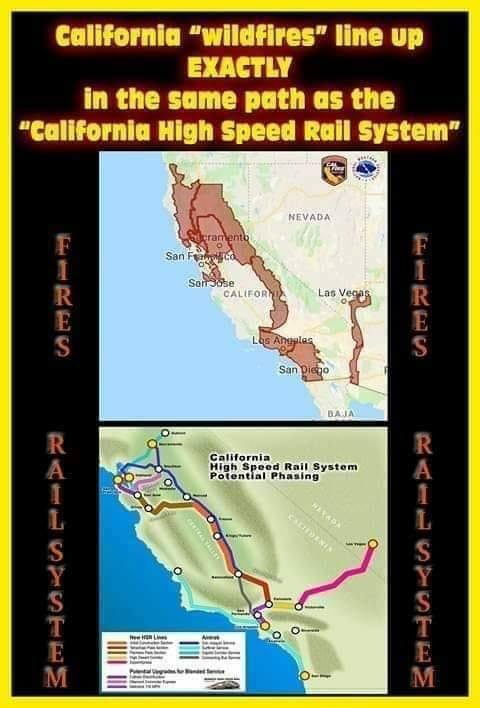 Sure, by placing two extremely low-res images sort of near each other and hoping your readers squint their eyes, one might convince a few that the red outline purported to be the extent of the California wildfires looked similar to the proposed map of the California high-speed rail. There are, of course, several problems with the comparison presented. First and probably most significant is the fact that the map purporting to show the extent of the wildfires (which, astute observers may have noted, appears to have consumed wholesale the cities of San Diego, Los Angeles, San Jose, San Francisco, and Sacramento) is actually a map of “red flag” warnings put out by Cal Fire on 11 November 2018. 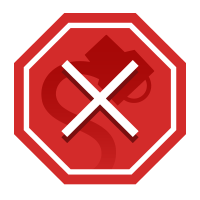 A red flag warning “is issued for weather events which may result in extreme fire behavior that will occur within 24 hours” and does not, as implied by the meme, represent areas that have burned. Los Angeles Times. 10 November 2018. Los Angeles Times. 12 November 2018.